Do you want to install Solar PV or other renewable energy systems in your home or in a commercial building? 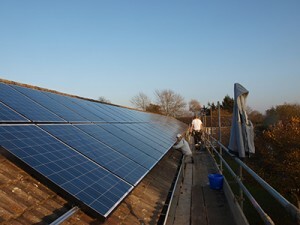 Our highly trained staff install Solar Panels in Oxfordshire and the surrounding area. We will survey you property and advise on how to get money back from using renewable energy. Following our survey and a quotation, we will install your solar panels or other renewable energy sytems. Contact us to find out more. Solar panels oxfordshire. This landlord takes advantage of the fit tariff as well as providing his tenants with free electricity.